Aurela Marku is 22 years young, she is Albanian and has been living in Greece for 16 years. She is a Beauty Therapist who specialises in nails, waxing, facials, body treatments and body massages. She has been in this industry for 6 years now. She works with passion and care. During the time she was getting her qualification, she was working in a restaurant which helped her gain experience in customer service. While she was in Greece, she worked in a hotel on the beach. Her job description was working as a spa therapist, taking bookings, payments, spa treatments and cleaning. As her social lifestyle, she is a quick learner. She loves learning different languages. She taught herself English and that is only one of the languages that she speaks. Her hobby is Salsa dancing and Reggaeton. Later on in her life, she made some changes. In November 2017, she left her home to move to London and find some new challenges. In less than 2 weeks, she was employed in a 4 star spa hotel. Where she got trained by ESPA. When she found some spare time, she decided to apply to take Spanish lessons. 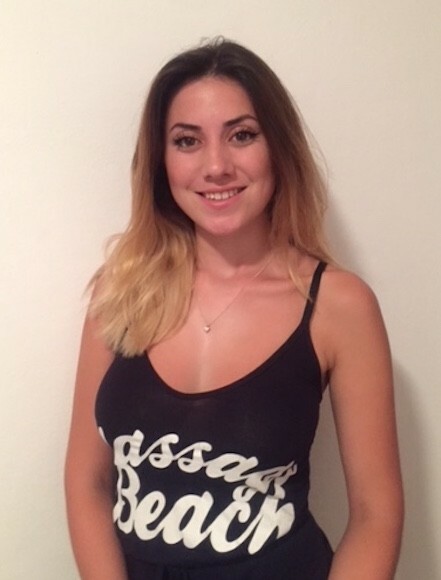 When spring came, one of her colleagues showed her this new opportunity to work for Massage Beach in Ibiza. She feels so motivated for this new chapter and will be sure to bring 100% professionalism to the team and her energy will spread around the team and the clients. She prefers that her clients leave with a smile and an amazing experience. She always listens to them and gives such good advice to improve their lifestyle. 31 Oct 2018 5.00 out of 5 Excellent service,well worth the money, very friendly. 29 Oct 2018 5.00 out of 5 Aurela was absolutely amazing! 28 Oct 2018 5.00 out of 5 Great massage, and great aftercare tips too. 22 Oct 2018 5.00 out of 5 We had so much fun with Aurela, she was GREAT with my 5 year old daughter. It was so relaxing and fun to have pedicures at the pool. Aurela was awesome. 14 Oct 2018 5.00 out of 5 Very relaxing treatment from a lovely therapist. Would strongly recommend Aurela. 07 Oct 2018 5.00 out of 5 Very good, very professional, very impressed. 20 Sep 2018 5.00 out of 5 I felt really spoiled! Aurelia is a gorgeous young lady, extremely polite and she is practicing her job with high professionalism! Kisses from all of us Robi, Sonia and Yanis!!!!! 18 Sep 2018 5.00 out of 5 Thank you so much, my knee feels loads better. Seb. 13 Sep 2018 0.00 out of 5 Aurela was amazing think I fell in love with her!! 05 Sep 2018 5.00 out of 5 Extremely professional and friendly approach, highly skilled massage. Amazing treatment! 22 Aug 2018 5.00 out of 5 ??? ????? ???? ???? ???? 30 Jul 2018 5.00 out of 5 She is so great and kind. Perfect service! 08 Jul 2018 5.00 out of 5 Aurela was great, really relaxing massage which i needed. Helped with my slipped disc issue too so much appreciated.